Harry and David Harvest Giveaway - 16 Winners. 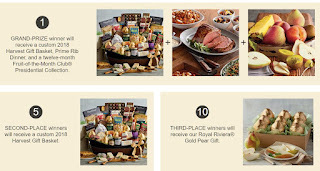 Win a Royal Riviera Pear Gift Set, Harvest Gift Basket or Grand Prize Feast. Limit One Entry, Ends 9/23/18. GOOD LUCK!! One (1) grand prize winner will be randomly selected to receive a Harry & David® Custom Harvest Gift Basket (Item #32806), a twelve (12)-month Harry & David® Presidential Fruit of the Month Club® subscription (Item #291) and a Harry & David® Gourmet Prime Rib Feast (Item #H32616). ARV of the Custom Harvest Gift Basket is USD $500.00. ARV of the twelve (12)-month Presidential Fruit of the Month Club® subscription is USD $369.99. ARV of the Gourmet Prime Rib Feast is USD $229.99. Total ARV of the grand prize is USD $1,099.98. In addition, five (5) entrants will be randomly selected to receive a Harry & David® Custom Harvest Gift Basket (Item #32806). ARV of each Custom Harvest Gift Basket is USD $500.00. Another ten (10) entrants will be randomly selected to receive a Harry & David® Gold Pear Gift Box (Item #32233). ARV of each Gold Pear Gift Box is USD $34.99.